I am sure that many of you have watched, as I have, the recent events unfold in our country. It is with a sick feeling I watch and listen to reports of healthcare overhaul that would make abortion a guaranteed healthcare option that tax payers would foot the bill for. It is with a sad heart I see the office of president lowered by the man who occupies it announcing he has no knowledge of an event and then in the next sentence says the police acted stupidly in that situation. 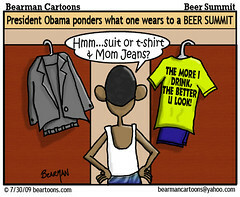 The final straw was yesterday’s ‘beer summit’. Our nation is running headlong and full speed into disaster and our president makes a photo-op out of a racial situation he fanned the flames on with the ‘beer summit’. Besides being, in my opinion, an embarrassment to the office of president and the nation, it is not Biblical (Pro. 31:4). We are the furthest away from the ideals the founding fathers set out for this nation we have ever been. And we are on a fast track to get even farther away very, very fast. A cursory glance at the Constitution will show that this nation was founded on Biblical principles, yet today many would have us to throw them right out with the trash. Contrary to most folk’s idea, this nation wasn’t founded for relief from oppressive taxation but to have the freedom of religion that we are slowly having stripped from us now. I pray that You will be patient a little while longer with our wretched behavior as a nation. I pray that Your children will stand strong for Your Word and that we will see a revival across this land of people turning from their wickedness and to the Savior.